"THIS IS A TEST" was the message that millions of Americans received on wednesday 3 October at 2:18. On the same day John McAfee sent out a Tweet with another warning. This was the first test of the new "Presidential Alert" wireless warning system sent out by FEMA (Federal Emergency Management Agency). It's different than other, mostly local alerts such as weather and amber alerts. The citizens of the US can't opt out for this "Presidential Alert". Everybody received it on their cellphone. You received Wednesday's alert because you have a cellphone and your service provider is one of the more than 100 service providers that participate in the Wireless Emergency Alert (WEA) system, which is run by the Federal Emergency Management Agency (FEMA). FEMA sent the alert as the first test of the system to push an alert to cellphones across the U.S. — what the agency is labeling a "Presidential Alert." WHAT MAKES THIS ALERT PRESIDENTIAL? The header "Presidential Alert" indicated that this particular message is meant to go out across the country during a national emergency. Other alerts are more local, notifying people of severe weather or Amber Alerts. Timing is always important. The time of the alert was: 2:18 which is the same as: 119 or 911. 2=1+1 (11) and 1+8=9 thus making it: 11 9. Nope. While cellphone owners can opt out of other alerts, there's no way to opt out of a "Presidential Alert." The only people who don't get this alert will be those without cellphones, out of range of cell towers, have their phones off, or have one of the few service providers that are not part of the WEA program. DOES THIS MEAN THE PRESIDENT CAN MESSAGE ME ANYTIME? Not really. Despite public concern that President Donald Trump might abuse the "Presidential Alert" system, there's legislation limiting what kind of messages can be sent. The system is also overseen by FEMA, so the president won't be the one pushing the button. John McAfee Says: "Wake Up People!" This man needs no introduction. If you've ever used a computer, you know his name. He's the man of the world famous anti-virus software. In a strange course of events Mr. McAfee sent out a Tweet, reacting on the "Presidential Alert". 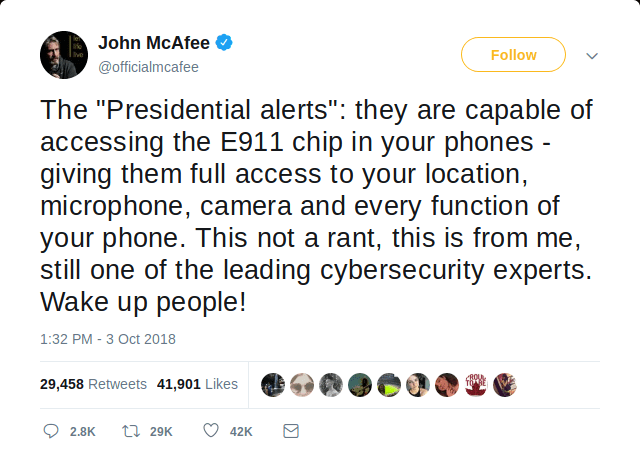 "The "Presidential alerts": they are capable of accessing the E911 chip in your phones - giving them full access to your location, microphone, camera and every function of your phone." However, former US presidential candidate, cybersecurity expert and blockchain advocate John McAfee warned citizens that the message was actually a surreptitious method of increasing US government spying on its own citizens. E911 is a system used in North America to automatically provide a caller’s location to emergency services dispatchers reached by calling 911. McAfee’s message was received loud and clear, by some at least, as his warning received over 30,000 likes and 22,000 retweets. McAfee previously ran as a Libertarian candidate in 2016 on the platform "we are adults in a world full of mystery." On Wednesday he announced "constant warrior" Rob Loggia as his presidential campaign manager for the 2020 campaign. Only a few days after the Sulawesi Tsunami Warning Lifted this Presidential Alert will be the 6th alert event of this year. Are all these alarm events just coincidences or is there a more stranger thing going on? Is AI doing a shock test? The 2nd alarm alert error was in Japan on January 16th, 2018. Japan's public broadcaster sent news alerts that North Korea has launched missile. The 3rd alarm alert error was on February the 6th, 2018 for the residents of the US East and Gulf Coasts and the Caribbean. A text message was sent to cellphones regarding a Tsunami. The 6th alarm event, United States of America on October 3, 2018. The FEMA sends ut a so called "Presidential Alert" test to all US citizens who have a cellphone.